One day, I tore up my bus ticket and walked home from school instead, with my next door neighbor, Eric who was a year older than me. He told me we’d get home around the same time as the bus and I believed him. That two mile walk took much longer than the bus ride, and my mother, frantic, drove her station wagon to find me and pick us up. I remember how ashamed I felt because I wanted to be a good girl, always, and please my mom. A few months later, I had a similar reaction when I inexplicably got a less-than-perfect C in math. I wanted to hide. I didn’t want to disappoint my parents. When I began to work with Wendy Appel on the social media launch of her book, InsideOut Enneagram, she sent me a PDF of her manuscript. I had previous exposure to the Enneagram, and I already knew my Type. I’m a Type Two: a People Pleaser. I have struggled with my people pleasing tendencies over the years. I say yes when I should say no, to avoid disappointing people. I want you to like me. When you don’t, I feel distressed, dejected even. Through Wendy’s book I am discovering my unique strengths as a Type Two, how I can appreciate and maximize those strengths, and tackle those little gremlins Wendy describes, that don’t serve me or others. In her book, Wendy has some useful exercises to help us drop our defenses, avoid our career derailers, and play to our strengths. And today is the big day — the day Wendy is launching her book into the world. I encourage you to buy the book, and the companion Enneagram Typing Cards, to discover your Type, your unique strengths, and how you can use the wisdom of the Enneagram to enhance your ability to lead yourself and others. 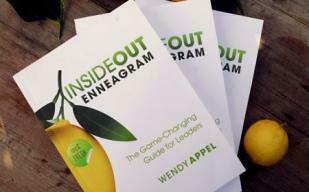 InsideOut Enneagram: The Game-Changing Guide for Leaders encourages readers to bring out their best and evoke that in others. InsideOut is a highly accessible and application-oriented book on self-leadership that uses the Enneagram as the map for your journey. This book is replete with useful exercises and practices, a personal journal, and a self-guided Enneagram Typing process. Order your copy of InsideOut for friends, family and colleagues at Amazon.